Original people deserve original art. I look at paintings and ask myself, 'if the lines were taken away, would I still recognize it?' Yes, I would. If I were to remove the color, would I still appreciate it? Probably not. Therefore, my focus is color. Experience has taught me perfection lies in imperfection. All the beauty of nature lies in her imperfect symmetry. Lines are blurred, edges soften, and colors speak. Each medium has its unique effects. I like to dabble in those capable of making their own statements through the subject matter. Image was taken from an alley in Benton Harbor, Michigan. This is a painting of Niles, Michigan at 2 am on a foggy night in December. A Reflection of Front Street. Image is from Front Street, Columbus, Ohio. This image is taken from Benton Harbor, Michigan. The rear of a Barbecue Shack. Spain: Untitled. Inspired by a photo taken by a friend while visiting Spain. The photo was taken in 2010 while in Chicago, Illinois. The image for the painting was taken by a friend visiting the Netherlands in 2014. A friend gave me permission to use his photograph as a resource. The photo is black and white, as was typical for the time. The colors I drew upon from childhood memories. 18x24 pastel on watercolor paper. The painting was inspired by cinnamon rolls. When I saw this, it was so surreal that I had to paint it. 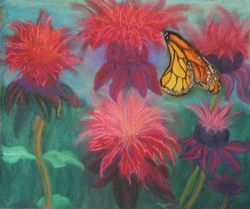 Would you like to see your ideas, memories, or fantasies re-created as art work? If so, contact me and together we can find a way. If you are local to Niles, Michigan and the surrounding area items are on display at the Niles Lakeland Hospital hallway leading out of the ER waiting room. Also, you can save on shipping by picking up your artwork in person. Contact me at brdnsky@gmail.com with an offer. Put Art in the subject. You can also contact me at 248.812.0334. Keep in mind that shipping costs will be added to the final price. All items shipped via UPS. Many of the pieces you see here were done while facilitating art classes. Students have claimed no talent and have received ribbons at the local fairs. You can find me at the Greater Niles Senior Center on Thursday mornings 10:00 - 12:00. On Fridays, I am at the Central County Senior Center in Berrien Springs 12:30 - 2:30. Have questions? Find me on FaceBook and Linked in. 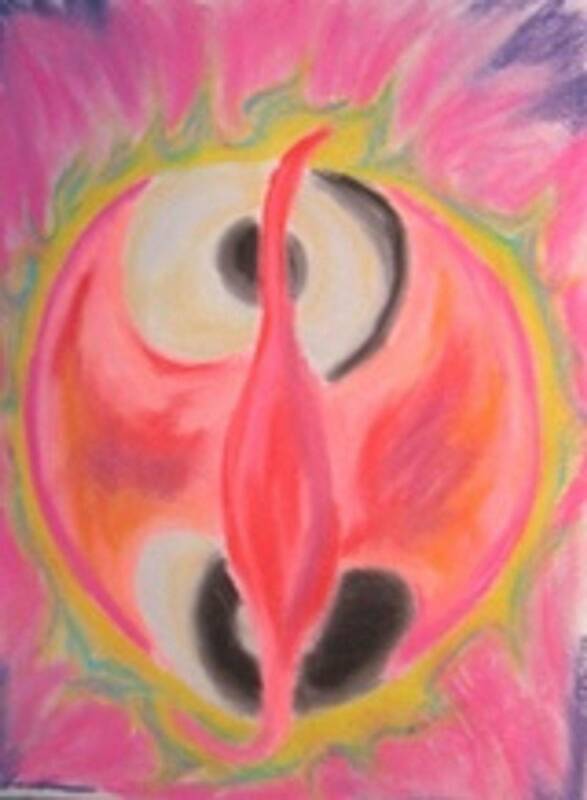 Dawn, the birth of creation. Humanity is stepping out of the flow of conscious and embarking upon the path of life. While the figures are male and female, the concept they represent are the unification of the opposing forces. A butterfly dining on the Beebalm in the garden.